Reprinted with the permission of A List Apart and the author. We, the people who make websites, have been talking for fifteen years about user experience, information architecture, content management systems, coding, metadata, visual design, user research, and all the other disciplines that facilitate our users’ abilities to find and consume content. Weirdly, though, we haven’t been talking about the meat of the matter. We haven’t been talking about the content itself. Yeah, yeah. We know how to write for online readers. We know bullet lists pwn. But who among us is asking the scary, important questions about content, such as “What’s the point?” or “Who cares?” Who’s talking about the time-intensive, complicated, messy content development process? Who’s overseeing the care and feeding of content once it’s out there, clogging up the tubes and dragging down our search engines? As a community, we’re rather quiet on the matter of content. In fact, we appear to have collectively, silently come to the conclusion that content is really somebody else’s problem—”the client can do it,” “the users will generate it”—so we, the people who make websites, shouldn’t have to worry about it in the first place. Dealing with content is messy. It’s complicated, it’s painful, and it’s expensive. And yet, the web is content. Content is the web. It deserves our time and attention. And that’s where content strategy comes in. Content strategy is also—surprise—a key deliverable for which the content strategist is responsible. Its development is necessarily preceded by a detailed audit and analysis of existing content—a critically important process that’s often glossed over or even skipped by project teams. That’s a tall order. I’d like to propose that, in fact, there are far too many “aspects of communication” for a solitary content strategist to truly claim deep expertise in all of them. Metadata strategy identifies the type and structure of metadata, also known as “data about data” (or content). Smart, well-structured metadata helps publishers to identify, organize, use, and reuse content in ways that are meaningful to key audiences. Search engine optimization is the process of editing and organizing the content on a page or across a website (including metadata) to increase its potential relevance to specific search engine keywords. Now, this breakdown certainly doesn’t imply that a content strategist can’t or shouldn’t be capable of playing these roles and creating the associated deliverables. In fact, in my experience, the content strategist is a rare breed who’s often willing and able to embrace these roles as necessary to deliver useful, usable content. BUT. And this is a big “but.” If our community fails to recognize, divide, and conquer the multiple roles associated with planning for, creating, publishing, and governing content, we’ll keep underestimating the time, budget, and expertise it takes to do content right. We won’t clearly define and defend the process to our companies and clients. We’ll keep getting stuck with 11th-hour directives, fix-it-later copy drafts—and we’ll keep on publishing crap. We can do better. Our clients and employers deserve it. Our audiences deserve it. We as users deserve it. When it comes to creating and governing content, it’s easy to forget what we want, or even worse, to settle for less. But until we commit to treating content as a critical asset worthy of strategic planning and meaningful investment, we’ll continue to churn out worthless content in reaction to unmeasured requests. We’ll keep trying to fit words, audio, graphics, and video into page templates that weren’t truly designed with our business’s real-world content requirements in mind. Our customers still won’t find what they’re looking for. And we’ll keep failing to publish useful, usable content that people actually care about. Stop pretending content is somebody else’s problem. Take up the torch for content strategy. Learn it. Practice it. Promote it. It’s time to make content matter. Published here on May 26, 2010. As founder and president of Brain Traffic, an nationally renowned agency specializing in content strategy and writing for the web, Kristina put content strategy on the map! 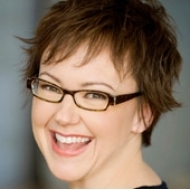 She is the author of Content Strategy for the Web, a must-have for anyone starting or managing a web site. Her professional background includes marketing, sales, public relations, and playwriting.